The words that follow should be read not as an attempt to offer conclusions about the meanings or value of The Dark Knight Rises, but rather as an invitation to critical conversation. There are several reasons for this. The first and most elementary is that I have only seen the film once. It is a long film, and one which I believe is most fairly described as combining complexity and confusion. The process of thinking and writing about the film, and discussing it with others, has caused me to question the assertion towards the end of my short review that ‘we understand why characters do what they do’, and to wish that I could revisit certain passages of the film to check whether there are details that I missed or have forgotten that would clarify the things that seem unclear to me. The account below is already the result of two sets of exchanges - with Pete Falconer and James MacDowell, from whom I borrow some excellent points. I hope that the conversation will broaden and continue on these pages. We see a similar thing going on in relation to Harvey Dent in The Dark Knight when (in a slightly hokey passage) he disarms a man who has managed to smuggle a gun into a criminal trial and barely stops to draw breath before continuing his display of legal brilliance. As Richard Dyer’s foundational work on film stardom demonstrates, the near-‘magical’ synthesis of the contradictory demands of a given culture is one very compelling way of explaining that elusive phenomenon called ‘charisma’. The legend of the man who shot Liberty Valance is used to help found a community based on values of property ownership, rule by law, and so on. Returning to The Dark Knight Rises: what is the legend of Harvey Dent used for? 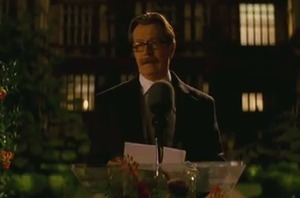 During Commissioner Gordon’s speech to mark ‘Harvey Dent Day’ (a public holiday - for Gotham City at least) he makes reference to the ‘Harvey Dent Act’. Although the details of this piece of legislation are never clarified, what does become clear is that it has extended the powers of the police, and been instrumental in ‘cleaning up the streets’ of Gotham. That is, this particular ‘champion of law and order’ is being used to shore up not liberal democracy, but something edging towards a police state. The film’s attitude towards this (as towards many other things) is not one hundred per cent clear. Gary Oldman’s Gordon is unfailingly dignified, and his competence and fairness make it virtually impossible to imagine him arresting an innocent person. He expresses misgivings over his actions, but these misgivings seem to relate more to the lie behind the Harvey Dent Act, rather than what the Act has achieved. An analogous problem underpins another moment in the film, when Bruce attempts to justify his holding of extra-legal supergadgets and his withholding of them from others by declaring that ‘one man’s tool is another man’s weapon’. In both cases, the characters seem to believe that it is OK that these laws or weapons of mass destruction exist, as long as you have the right people in charge of them. Or the right country, perhaps: in this attitude to jurisdiction and weaponry, we can see an echo of American exceptionalism. It is a viewpoint that the film does not distance itself from, and therefore might be taken to tacitly endorse. The years since The Dark Knight have been marked, above all, by the Global Financial Crisis. The Dark Knight Rises is a recession text in some of its throwaway details and many of its key plot points. 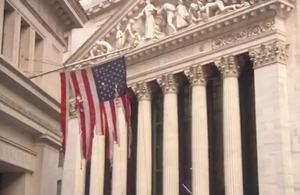 When the film’s villain Bane (Tom Hardy) enters Gotham’s stock exchange, a broker tells him ‘There’s no money here you can steal’, and the snappy reply is ‘So what are you guys doing here?’ Shortly thereafter, Bane and his gang escape by tying suited stockbrokers to their motorcycles and using them as human shields. 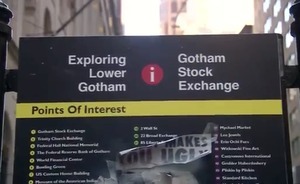 The objective of the infiltration of the exchange is to fraudulently trade Bruce’s stock and bankrupt Wayne Enterprises. The effects of the behaviour of those at the top of the economic food chain upon those at the bottom are dramatised via a heartstring-tugging staple of melodrama in general and superhero movies in particular: orphans. 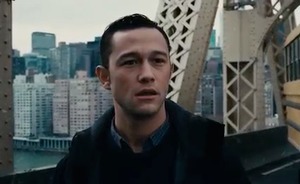 When good cop Blake (Joseph Gordon-Levitt) visits the orphanage where he grew up, he learns that once its charges reach a certain age they can no longer be accommodated, because the money from the Wayne Trust that made that possible has stopped trickling down. When Bruce, after hearing this, asks manservant Alfred why the stream has run dry, the reply is that the Wayne Trust is funded by the profits of the recently fallow Wayne Enterprises. Through a combination of the money and political connections of Daggett and the willing manpower recruited by Bane, Gotham City, in a compelling piece of symbolism which yields spectacular scenes of destruction, ends up peppered with large patches of concrete laced with explosives. After detonating those explosives and thus cutting Gotham City off from the rest of the USA (the threat of Gotham being sacrificed like a diseased limb by the rest of the US invites comparisons with Cloverfield and Avengers Assemble ), Bane strolls out onto a football field. He unveils a decaying nuclear reactor. The clock is ticking: in a matter of weeks, it will explode. In the passage of the film that ensues, we get another of Hollywood’s recent tentative imaginings of what social breakdown might look and feel like. It is probably the film’s most politically-loaded passage, and is therefore the one I would like to spend most time discussing. 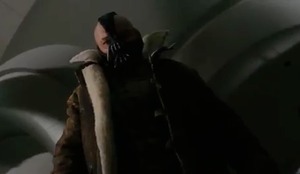 Bane tells the television cameras ‘The powerful will be ripped from their decadent nests […]. Courts will be convened. Spoils will be enjoyed.’ We cut to scenes showing his bidding being done. The principal dramatisation of this state of affairs is the ‘kangaroo court’ that delivers summary justice to those who come before it. The choice offered, between ‘death’ and ‘exile’, is in truth no choice at all, as Gordon discovers when he chooses death, only to hear the verdict ‘death, by exile.’ The judge sits atop of a pile of furniture which resembles a fort assembled by children, wearing a suit that is coming apart at the seams. Another striking ‘excesses of the revolution’ moment during this passage of the film comes when Selina Kyle, aka Catwoman, finds herself in the Wayne mansion. ‘This was someone’s home,’ she tells her friend. ‘And now it’s everyone’s home’, the friend replies, before reminding Selina of something we have also heard her say: ‘“There’s a storm coming,” remember? This was what you wanted.’ Selina prophesies a storm near the beginning of the film when she sees Bruce, telling him: ‘You’re gonna wonder how you ever thought you could live so large and leave so little for the rest of us.’ In the Wayne mansion, however, Selina is not convinced by her friend’s rejoinder, and we are given a moment of troubled interiority and silence. Perhaps this could be filed under ‘be careful what you wish for’, a cautionary tale for would-be revolutionaries who might benefit from being shown that they would not have the stomach for the violence that would almost inevitably accompany swift and wholesale redistribution of wealth. However, the moment seems to me to be at least slightly more interesting than this. Up until now, we have seen the Wayne mansion standing proud and almost empty, a symbol of one kind of spiritual near-death. However, although anyone may now be free to move through this space, what it appears to be filled with is not joy, but something closer to frenzy. The question of whether a building that is everyone’s home can be anyone’s home is a difficult one to answer. Certainly, to answer in the positive would require amendments to most people’s definition of that concept, a concept which is a fundamental part of most people’s understanding of identity (one important thing common to both being another complex and fundamental concept: privacy). I am not entirely unsympathetic to what Jones is saying, and I think his schematic interpretation of the film offers a valuable starting point. However, I think there is more to say on these matters. It might be useful to linger briefly but explicitly upon an obvious point: the cluster of circumstances faced by the citizens of Gotham is extreme. They are subject to a siege by a masked dictator leading an underground army, and there is little prospect of their futures extending much beyond the immediate. When it comes to predicting how people would behave in such circumstances, I would not like to place bets. Therefore, to map the behaviours we witness in Gotham too simplistically onto even an imagined (and hyperbolized - ‘a right-wing fantasy’) real-world scenario might still be a stretch. Nevertheless, we are in the terrain of the superhero movie, where fantasy and political allegory go hand in hand, so this disclaimer can only be partial. 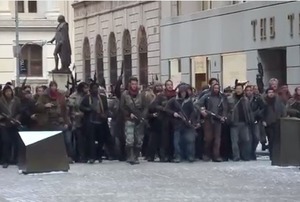 Moving on to a less imponderable realm, and one where the details of the film itself make a difference to what we can claim about it: I believe that a matter of central importance when it comes to interpreting The Dark Knight Rises and its politics is the issue of how the film represents the ‘ordinary citizens’ of Gotham and their actions. My contention (which I am willing to see overturned by readers who may have retained details that I have not) is that ‘ordinary citizens’ are in fact something of a structuring absence in the film. One important set of agents in The Dark Knight Rises is the ‘army’ of the disaffected that Bane has given purpose and recruited to his cause. Another is the likes of Batman himself and his allies - Lucius (Morgan Freeman), Commissioner Gordon, and Blake. These characters reside near the top of the film’s knowledge hierarchy. They hold no illusions about how the world works. The films’ villains are, in this sense, their negative reflection. In between, there is, presumably, a mass of ‘ordinary citizens’ who hold jobs and own possessions, which give them a stake in the order of things (to use a vocabulary and a way of thinking that is, I think, too quickly and easily dismissed by Jones as necessarily paving the way to conservatism), but who lack the power and the knowledge of the stratum occupied by the likes of Wayne and company. Again: how are these people represented? The remarkable answer is: hardly at all. It is possible that these hitherto law-abiding citizens swell the ranks of Bane’s army once it surfaces, and helps to execute summary justice in the kangaroo courts. But is this ever confirmed? The top figure in the courts is most certainly not an ordinary citizen: he is Dr Jonathan Crane (Cillian Murphy), aka The Scarecrow, the villain from the first instalment of Nolan’s trilogy. At this point, the reader might object, and point out that ordinary citizens are represented, by two different groups. 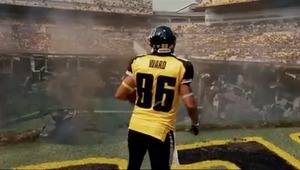 The first is the crowd at the football game that Bane so dramatically interrupts. There is more to say about this crowd and this scene than I can say here. Clearly, it is important that the crowd sings ‘The Star-Spangled Banner’, and it is also important that they possess the more partisan commitments of sports fans. However, the crucial point for the present argument is that the scene in which these ordinary citizens appear is placed on the cusp of the narrative passage I want to explore. It is the representation of the actions of ordinary citizens once the political reality they are faced with becomes clear to them that is my central concern here, and the football scene leads up to this, rather than being part of it. The second group are the police officers whom Bane strategically buries underground when he detonates all his explosive concrete, helping the pave the way, as it were, for his martial law. Of course, police officers are citizens. However, in a world where a man puts on a mask and cape and takes on a different identity, we cannot be oblivious to the significance of uniforms. We have even less chance of ignoring this significance when the film spells it out for us yet further. During the siege of Gotham City, Gordon bangs on the door of Deputy Commissioner Foley (Matthew Modine). His wife answers, and tries to pretend that Foley is not in, a charade that Gordon cuts through. Foley and Gordon then proceed to argue about what can and should be done about Bane. Exasperated, Gordon tells Foley that he is hardly asking for him to parade the streets in full dress uniform, but that he should nevertheless be trying to save his city. Foley disagrees. The film is deliberately emphatic about the clicking closed of the front door that signifies Foley’s decision to act as a private citizen who exercises the right to close the door on, and try to shut out, the demands of the outside world, even as that world threatens to destroy that barrier, figuratively and literally. This moment strongly (and, quite possibly, deliberately) echoes a moment from High Noon (1952). In that film, Marshall Will Kane (Gary Cooper) finds that no-one in the town that he helped to make safe for decent citizens is willing to risk his own life when a pardoned murderer returns to the town in seek of revenge upon Kane. At one point, Kane visits the house of an ex-deputy, only to be told by his wife that he is not in. Kane, like Gordon, sees through the lie, but unlike Gordon, acknowledges this only with his demeanour and not his words. In The Dark Knight Rises, we get the emphatic closing of a door. In High Noon, we get the similarly emphatic image of Kane closing a gate at the end of the longest garden path we see in the film. This gesture is famously repeated in Dirty Harry (1971). 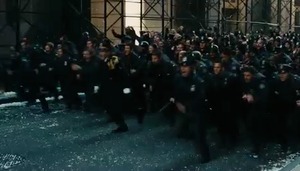 It is also repeated in The Dark Knight Rises, when Blake tosses his GPD badge into the river. We might say that - in a film that can be profitably mapped, dramatically and thematically, as a series of choices by its characters between different components of their identities - Blake’s self-identification as an orphan trumps his self-identification as a cop (a little earlier, Blake has tried to get a busload of orphans across a bridge to safety, but the cop on the other side enforcing Bane’s rules blows it up). Foley, after shutting the door on Gordon, experiences a change of heart. When the policemen, liberated from their underground confinement, gather for a heroic charge against Bane’s army, he stands at the front, brandishing a gun, and wearing, of course, full dress uniform. This, surely, should be interpreted not as Foley fulfilling his duties as a citizen, but acknowledging, via the donning of the uniform, that this is his duty as a police officer. It is a trope of army movies that a soldier’s rather abstract allegiance to his or her country is shored up by a much more tangible one to his or her immediate circle. To invoke once more Pippin’s perspective: the identity of police officer supplies Foley with the motivation and investment that the identity of ‘citizen’ cannot quite muster. This absence of any character we can confidently label as ‘just’ an ‘ordinary citizen’ is an intriguing feature of The Dark Knight Rises. Such a figure could have been dramatised, and an organization of such citizens could have been given an important role in defeating Bane’s plan. There are too many imponderables to allow this question to be conclusively answered, but it is worth wondering whether such a turn of events would be accepted as credible by an audience, and what would be required to make it so. To return to John Bleasdale’s suggestion: in The Dark Knight Rises it is not so much that ‘society’ is distrusted, but that the film has some difficulty representing such a thing. 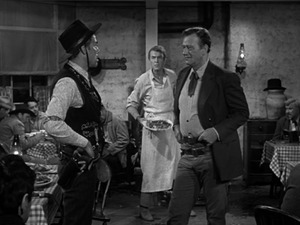 In High Noon, the church provides a civic forum, something in the nature of a ‘public sphere’, for the townspeople to weigh up the merits and demerits of assisting Kane. The Dark Knight Rises does not manage to create any such space, or stage any such conversations. Bane’s recruits believe that there is no such thing as society, or that if there is, it has let them down and given them no place in it. For businessmen like Daggett, the market and self-interest reign supreme. Batman and his associates, and, in a different way, the police, see society as something to be upheld from a position of at least one remove from it. Their adversaries hold it at a similar distance but seek to destroy it. The people of Gotham and what these people need are obsessions of Christopher Nolan’s Batman trilogy; but, in The Dark Knight Rises in particular, those people are a structuring absence - everywhere referred to but nowhere seen. The dramatic challenge of giving private citizens a public face and voice points to a pressing political challenge: how can society’s middle-level ‘stakeholders’, who stand between the explosive mixture of abject poverty and rapacious greed, come to recognize themselves and to act as a viable political force which could foster investment, psychological and economic, in a thing called society? This Alternate Take was published on July 22, 2012.